You are here: Home / Sweden’s coolest policewoman is back! Sweden’s coolest policewoman is back! Anna Karolina Larsson debuted last year with Stolen Baboon a female take on the slick, modern gangster thriller and ”one of the most interesting debuts in the genre”. This suspenseful, literary and above all completely new crime novel was also nominated for the Crimetime Specsavers Debut Award 2015. Now Anna Karolina Larsson is back with a second novel about her main character, the headstrong, independent and very likable Amanda Paller. No More Fish in the Sea is a sequel that surprises with its spectacular theme and the way the plot is built around the main characters. Three years later Amanda is now the mother of twins! When several cannibalistic murders take place in Stockholm Amanda is put on the case. At each crime scene there is a different murderer, a murderer under the influence of the dreaded cannibal drug. Amanda is convinced the murderers are victims, forced or tricked into taking the drug. Who is behind the druggings that makes people kill loved family members? After several years abroad return Adnan to Sweden to clear his name and make up with the past. The inevitable happens and Amanda and Adnan meet and realize they are connected to the case in more than one way. Like the debut No More Fish in the Sea is a plot-driven thriller set in the borderland between right and wrong and an austere and fast-paced style characterizes the novel. Leif GW Persson has written about police work in an authentic way and Jens Lapidus has portrayed the career criminals from an insider’s perspective without moralizing. 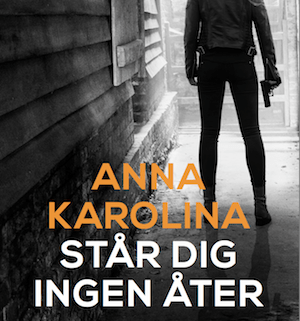 Anna Karolina combines these, cranks up the pace and gives us Sweden’s coolest police woman. The plot is complex and gruesome. And terribly exciting in addition. Anna Karolina skilfully connects the different parts of the plot and maintains the pace throughout the book. Her description of the underworld is Lapidus-esque, and gives a good account of the stuff that happens where most of us have never ventured. I read without stopping and marvel at the particularly vivid, realistic characters. What really sets it apart, however, is the sensuality. Never before have I read a Swedish novel that is so concerned with bodies, both at the gym and in bed, and that at the same time manages to describe everything so authentically and eloquently. This is the explanation for my very own ”ok, just one more chapter”. Just like the debut, “No More Fish In the Sea” is an exceptionally well-written and profound crime novel, a worthy sequel to “Stolen Baboon”, and a book that confirms that Anna Karolina is a Swedish crime writer to look out for. 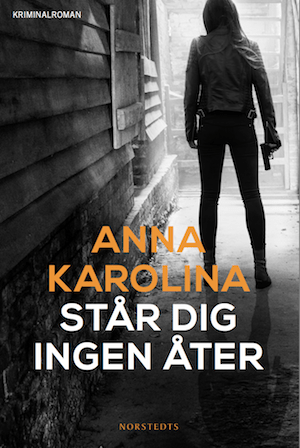 After several years with the Stockholm Police department, officer Anna Karolina Larsson decided to use her inside knowledge of Stockholm’s criminal world and write a novel. She enrolled at the Writers’ Academy at Lund University and it soon became obvious that she has great talent. Not only does she skilfully use her knowledge from her work to describe the police procedures and the criminal world with great authenticity, she also portrays the ties between the characters, the weight of betrayal and expectations and disappointment with seldom seen credibility. http://www.nordinagency.se/wp-content/uploads/2015/05/STÅR-DIG-INGEN-ÅTER.png 448 300 Anna Frankl http://www.nordinagency.se/wp-content/uploads/2014/02/new_logo.png Anna Frankl2015-11-11 17:36:062015-11-12 17:49:16Sweden’s coolest policewoman is back! Nordin Agency is proud to welcome Camilla Sten to the agency! Welcome to Nordin Agency, Amanda Hellberg!